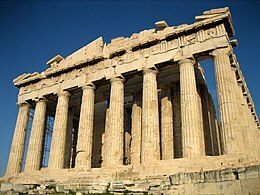 Parthenon, exemplum eminentissimum antiquitatis classicae. Fines Etruscorum circa annum 800 a.C.n. Foedus Delium bello Peloponnesiaco anno 431 a.C.n. Antiquitas classica, vel simpliciter antiquitas, est spatium temporis quod in regionibus Mediterraneo mari adiacentibus fere a saeculo VIII a.C.n. ad nostrae aetatis saeculum VI intercessit. Quae appellatio praecipue culturam Graecorum et Romanorum complectitur. Eo tempore litterae Graeco-Romanae florebant, ac potestas Romana in regionibus Europae, Africae Septentrionalis, et Asiae Mediae valebat. Beavis, Ian C. 1988. Insects and other invertebrates in classical antiquity. Exeter, Devon: University of Exeter. ISBN 0859892840. Bugh, Glenn. R., ed. 2006. The Cambridge companion to the Hellenistic world. Cantabrigiae: Cambridge University Press. Burkert, Walter. 1992. The Orientalizing revolution: The Near Eastern influence on Greek culture in the early Archaic age. Conv. Margaret E. Pinder et Walter Burkert. Cantabrigiae Massachusettae: Harvard Univ. Press. Erskine, Andrew, ed. 2003. A companion to the Hellenistic world. Malden Massachusettae et Oxoniae: Blackwell. Flower, Harriet I. 2004. The Cambridge companion to the Roman Republic. Cantabrigiae: Cambridge University Press. Garnsey, Peter. 1999. Food and society in classical antiquity. Cantabrigiae et Novi Eboraci: Cambridge University Press. ISBN 0521641829, ISBN 0521645883. Green, Peter. 1990. Alexander to Actium: The historical evolution of the Hellenistic age. Berkeleiae: University of California Press. ISBN 0520056116. Grinin L. E. 2008. Early State in the Classical World: Statehood and Ancient Democracy. In Hierarchy and Power in the History of civilizations: Ancient and Medieval Cultures, ed. L. E. Grinin et al, 31–84. Moscuae. Early State in the Classical World. Hornblower, Simon. 1983. The Greek world 479–323 BC. Londinii et Novi Eboraci: Methuen. Kallendorf, Craig W., ed. 2007. A Companion to the Classical Tradition. Malden Massachusettae: Blackwell. Kinzl, Konrad, ed. 2006. A companion to the Classical Greek world. Oxford and Malden Massachusettae: Blackwell. Murray, Oswyn. 1993. Early Greece. Ed. 2a. Cantabrigiae Massachusettae: Harvard University Press. Rhodes, Peter J. 2006. A history of the Classical Greek world: 478–323 BC. Blackwell History of the Ancient World. Malden Massachusettae: Blackwell. Rosenstein, Nathan S., et Robert Morstein-Marx, eds. 2006. A companion to the Roman Republic. Oxoniae: Blackwell. Shapiro, H. Alan, ed. 2007. The Cambridge companion to Archaic Greece. Cambridge Companions to the Ancient World. Cantabrigiae et Novi Eboraci: Cambridge University Press. Shipley, Graham. 2000. The Greek world after Alexander 323–30 BC. Londinii: Routledge. Walbank, Frank W. 1993. The Hellenistic world. Ed. retractata. Cantabrigiae Massachusettae: Harvard University Press. ISBN 0674387260. Novissima mutatio die 28 Octobris 2018 hora 12:40 facta.